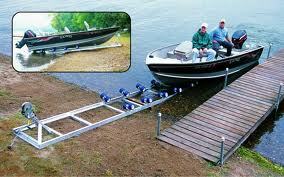 Roll-n-Go offers innovative docking solutions, making inaccessible shorelines a thing of the past. 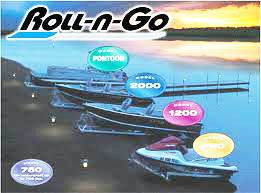 With several models to choose from, Roll-n-Go has the system that will make getting your small craft in and out of the water part of the fun! Glide easily in and out of the water in just seconds without scratching your craft’s hull. Roll-n-Go’s ramp is lightweight, portable, and economical in construction. This system combines durable, rust free compents with all the standard features. 18′ overall length, 1,100 lb. winch with a 20-ft strap, and (12) non-marking polyurethane “donut” rollers make this the ideal model for smaller fishing, sail, and row boats. 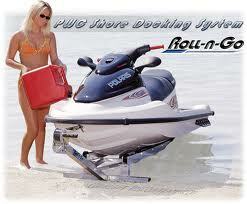 From Personal Watercraft to pontoon boats, Roll-n-Go has the model to meet your needs! Each model is constructed with quality materials and with an easy to assemble design.